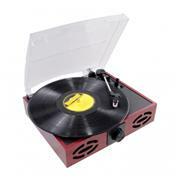 Check out this classic wooden turntable from Pyle. It plays 33, 45, and 78 RPM vinyls. It’s equipped with automatic and manual stop for easy operation. Best of all, you can use it to convert your old records to digital music files -- just hook it up to your computer with the included USB cable and use the free Audacity software. Two built-in speakers provide rich, full-range audio, and stereo RCA output allows you to connect this turntable to your home audio system for even bigger sound. It’s all in a beautifully crafted wooden cabinet with a plastic dust cover. * Dimensions: 12.60" x 11.02" x 3.54"